A major new leak has spilled all the information we could hope to see on the Galaxy S10. 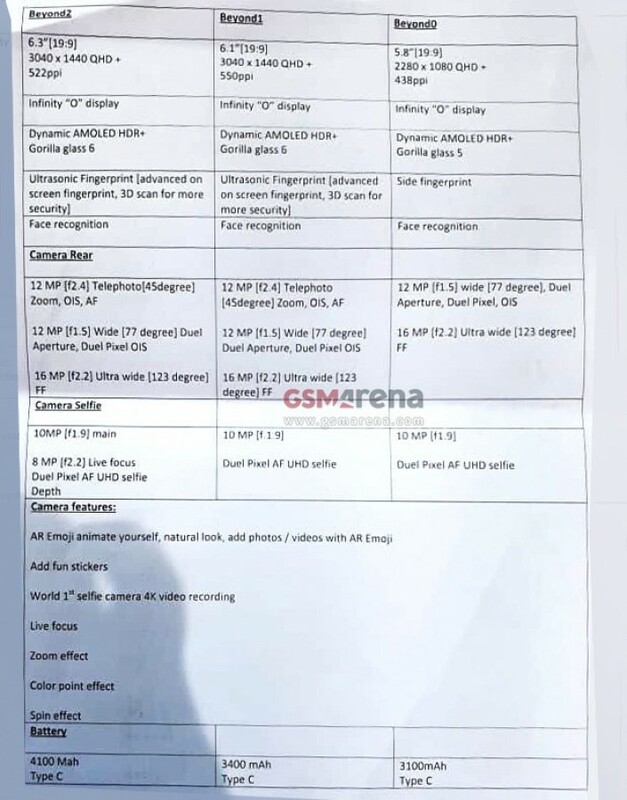 GSMArena has published pictures of two sheets that mention the specs and features of the Galaxy S10e, Galaxy S10, and Galaxy S10+, confirming some already known details while offering a slightly different take on others. For example, the Galaxy S10+ is listed with a 6.3-inch display instead of a 6.4-inch display, although this could just be a rounding error as 6.39 inches was the exact rumored size before this. 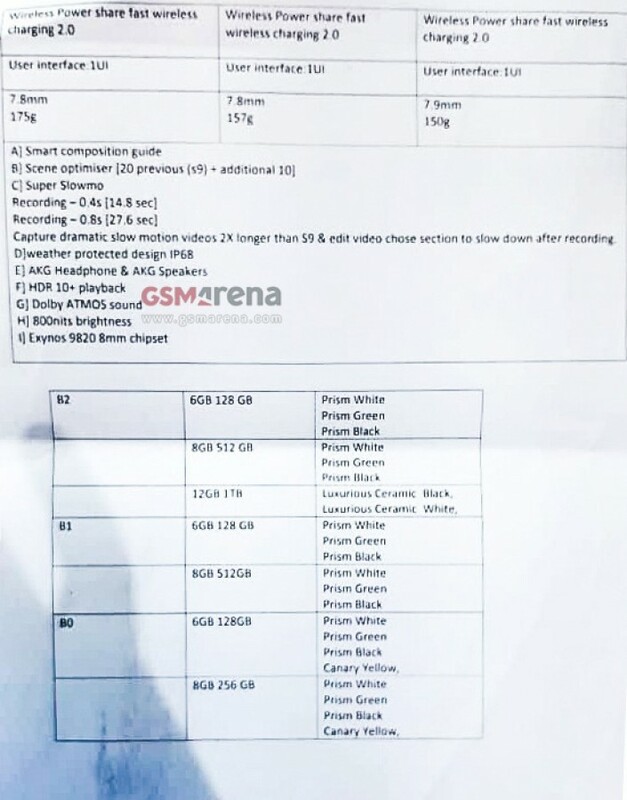 Or, well, these documents aren’t really accurate or based on actual sources, since there are quite a few errors here, like the Galaxy S10e display resolution listed as 2280×1080 pixels and dubbed QHD+ (the S10 and S10+, meanwhile, are listed with 3040×1440 QHD+ displays). The documents also describe the Infinity-O display as “Dynamic AMOLED HDR+” and mention Gorilla Glass 6 protection. The displays will apparently reach 800 nits of brightness, and ultrasonic in-display fingerprint sensors are mentioned as well. The documents also list detailed camera specs. You have the same 12MP primary F1.5-2.4 sensor with Dual Pixel autofocus and 12MP F2.4 telephoto lens with OIS as the Galaxy S9+ on the back, with a 123-degree ultra-wide 16MP F2.2 sensor added to the mix. The Galaxy S10e gets only the regular and ultra-wide cameras, which means the smaller model may once again miss out on zooming capabilities. As for front cameras, the S10e and S10 have a 10MP F1.9 sensor, while the S10+ gets a second 8MP sensor for Live Focus pictures. As hinted at by Samsung Vietnam with a teaser video, the Galaxy S10 will let you shoot 4K videos with the selfie camera. Optical image stabilization for the front camera was also teased in the video and rumored earlier, but that’s not listed in the leaked documents. Sadly, there’s no mention of something like Bright Night in the list of camera features, either. But the S10 could let you record Super Slow-mo clips of 0.8-second moments (the S9+ and Note 9 only offer the 0.2-second and 0.4-second options). There’s more. Battery sizes of the three models are included: 3,100 mAh, 3,400 mAh, and 4,100 mAh for S10e, S10, and S10+ respectively. That extra 100 mAh is because Samsung now has both total capacity and rated capacity mentioned on its batteries, and the latter is what actually matters at the end of the day. Reverse wireless charging is also in there, and so is the 12GB+1TB configuration for the S10+. The ceramic version is only listed with 12GB+1TB, but it’s possible the ceramic model may also come in an 8GB+512GB configuration in some markets. Last but not the least, the Galaxy S10e is listed with 8GB of RAM and 256GB of storage, which is suspicious since all rumors until now have said the S10e will only come with 6GB of RAM and 128GB of storage. But, again, there is no telling how much of this leak is accurate and how much is just existing info rounded up. We’ll leave you to decide, although it would be better to just hold off from coming to any conclusion before the official Galaxy S10 launch on February 20. I’m excited about true 10-bit HDR (S9 had an 8-bit screen), but seeing the same Galaxy S7 camera for the fourth year in a row is a bit annoying. The S7 retailed at £569 and had better display density three years ago. Progress! The LG G3 retailed at €500-550 5 years ago and also had a 2k screen. And basically the same main camera. parshakov What if I told you the MP is not everything in a camera? Variable aperture makes a difference if you know how to take photos. Megapixel count isn’t everything BUT it’s very important. The fewer megapixels you havez, the less information the camera has to work with. And these 12mp cameras were ALWAYS a bad idea. They were a bad idea on the S7, they were a bad idea on the S8, continued to be a bad idea on the S9 and will remain a bad idea on the S10. But S10 have bigger screen. Bigger screen = lower density. How does the S10 stack up against the Note 9 ? Maybe Sammobile will compare S10 to another phones after unpacked event. I’m sure they have already prepared a lot of articles about it. They writing about rumors but they know a lot of more. So, the S10e gets a far worse resolution than the 3 year old S7 for no good reason and worse glass (Gorilla Glass 5 is scratchy crap compared to the previous gens…). And you expect me to NOT call this “S10 XR”? Honestly, I really hope this information regarding both the GG used and the resolution are false. There’s no good reason why Samsung would make a phone with such an awful screen…unless they indeed intend to copy Apple’s failed 2018 iPhone line-up. I will retract my comment… This maybe true specs but it’s shame they lowered the s10e resolution… Though be honest how many ppl actually use qhd+ setting on their s7,s8,s9 and notes? Awful screen? I doubt that very much. Unless you’re using VR that is. Yes, awful screen. The S7 had a ppi of 577. The S9 with the same 5.8″ screen a ppi of 570. If the S10e comes with one of 438ppi, that’s a MASSIVE drop in screen quality EVEN without putting the phone on a VR headset. Worse than that, it’s an unjustified drop of quality. Specially when the price is supposed to be upwards of 750€ which is MORE than the launch price of the S7. If this isn’t fake, yeah, this is pretty much an S10 XR: an overpriced, compromised version of the flagship with a crap screen. If these specs for the S10e are right, the phone isn’t worth more than £500 at best.